I've seen several awesome conversions using the Dark Elf Sorceress as the basis, like the Khalida model I featured on here awhile back. This is yet another stunning use of a classic model. The conversion on this is pretty flawless, with all of the noticable Elfy elements removed, and a bit more clothing added. It's pretty cool that the extra clothing added has a definite human touch to it too, with chunkier belts and buckles to further distance itself from the lithe Elf aesthetic. Having the flames from the brazier turning around in the air to go the same direction as her hand is a nice touch. It would have been easy enough to just have it pointing in the same direction, but by having this mid-air change of direction you really get the sense of it being magical. The fact that her hair and clothes are all moving in the same direction just further reinforces it. The painting on this is outstanding as well, with everything having a warm tones. It's all reds and browns, and even her skin has a ruddy tone to it. 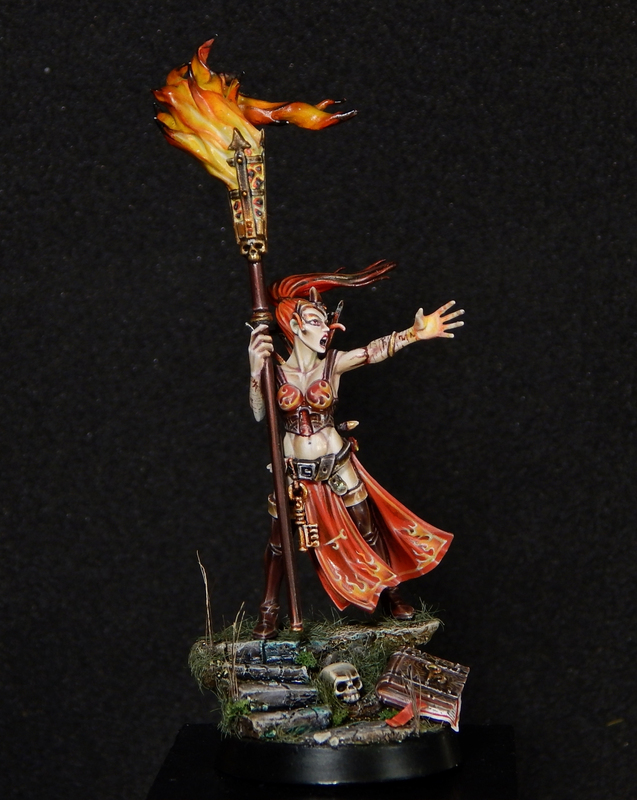 The freehand flames on her top and cloth are perfectly done, and very fitting for a fire wizard. Everything is super crisp and smooth, and all of the colors are rich and saturated. It definitely reminds me of the 'Eavy Metal style, but with its own twist. The base is nice and simple, to act as a framing device, but still has enough detail to interest the eye and tell a story. Overall this is a very, very well done conversion. 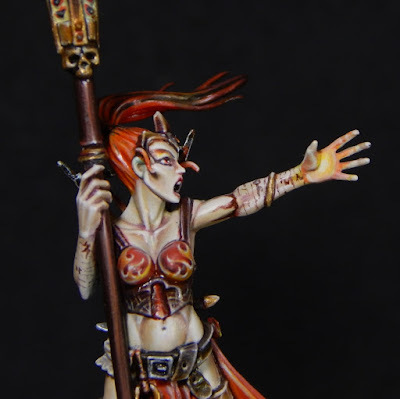 Be sure to check out more views of the model on Cool Mini or Not and show the artist some love if you like it.